Emma Christy Baker, one of the first female police officers in Indianapolis, was born on February 10, 1865 in Salem, Indiana. Her parents, William W. and Hester Christy, were free African Americans who settled in Indiana during the 1830s after leaving Newberry District, South Carolina. Her family moved to Indianapolis when she was only an infant. Emma attended and graduated from Public School Number 17 and Shortridge High School. On July 9, 1889, Emma married a barber named David M. Baker. Throughout her young adult life, Emma worked at her father’s laundry. However, in 1918, her career took a drastic turn. By this time, Christy was well-known throughout the Indiana community. 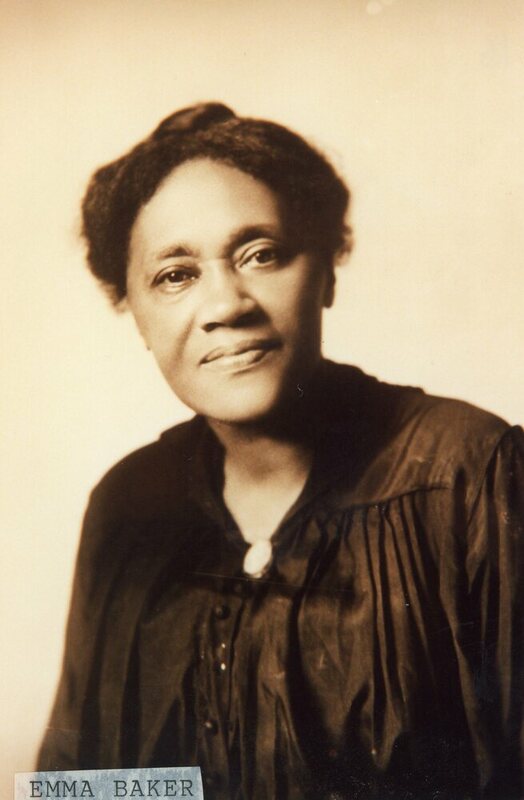 She now owned her father’s laundry business and was a member of Bethel African Methodist Episcopal Church, Old Settlers Social, and the Civic Club. At the time, there was a need for more police officers. Recommendations were made in a 1917 report of the New York Bureau of Municipal Research, that Indianapolis needed to employ policewoman and female sergeants. On June 15, 1918, Emma became the first woman and African American woman police officer in the Indianapolis Police Department through her positive reputation in her community. She wore a badge and earned the same wage as a male police officer. During World War I, Emma and another woman, Clara Burnside, became the first women to work outside of the police station. Baker patrolled public spaces in Downtown Indianapolis. Her primary job was to uncover shoplifting and minor theft crimes. In 1922, she went on to serve at Juvenile Court in the Probation Department. In 1931, she was the only African American working there. In 1938, the Great Depression hit and there was a new chief of police who had a prejudice against women being police officers. This led to her being made a matron in a jail, where she watched over inmates. It wasn’t the most glamorous of jobs, but Baker did her job effectively. Emma Baker eventually retired in October of 1947. The African American community appreciated Baker’s hard work and dedication for protecting the community. In October of 1947, Baker was one of 70 African Americans who represented business, labor and professional groups, and civic engagement who were placed on a special committee to elect William H. Wemmer (a Republican) to be Mayor of the city. Although Baker died in 1955, her legacy lives on. Her story has been honored by different groups of people and organizations like the Indiana Commission for Women. Crown Hill Cemetery (where Baker is buried) also honors her story by including Officer Baker in their heritage tours. Abigail Bragg, “Emma Christy Baker,” Discover Indiana, accessed April 25, 2019, https://publichistory.iupui.edu/items/show/411. Published on Jul 25, 2018. Last updated on Apr 2, 2019.